Facts about Sioux Water Lily plant. The Sioux lily is an aquatic hardy plant of zones four to eleven was developed by Joseph B.L. in the year 1908. The Sioux Water Lily plant is considered to be hardy because it can tolerate cooler temperatures. It comes from the genus Nymphaea. The lotus plant can grow horizontally across spreading to about three to five feet (.91 to 1.52 meters). 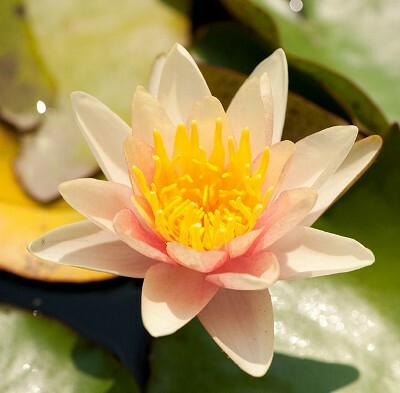 The Sioux Water Lily plant is a free flowering plant. The blooms of the lotus can establish to a height of three to four inches (7 to 10 cm). Each flower has about nineteen to twenty petals with their blooms raised just at the water surface. The flowers of the Sioux Water Lily forms a star shape with changing colors of deep orange to coppered to chrome yellow with deep yellow stamens. Sioux Water Lily leaves grow eight to nine inches (20 to 23 cm) wide with a deep green color. The free flowering bloomer can have its flowers stay open the entire day, extending very late in the day. The plant has colorful floating blooms which enhances the pod to which they are established. It is a favorite of various pond and aquatic garden owners. When established, the plant can grow approximately twelve to eighteen inches (30 to 46 cm) deep. The Sioux Water Lily can be consider to be a true bowl pot plant as it can do well in containers. However, it can also be established in ponds. It requires a two gallon (7.5 liter) container or larger. In additions, soils must be well drained. The Sioux Water Lily plant requires a partial shade to full sunlight. Planting of the Sioux Water Lily includes the usage of plant bag. Individual rhizomes of the Sioux lily plant are submerged in an aquatic media to a depth of six inches (). As the Sioux Water Lily establishes, it can be lowered to its standard depth of six to twelve inches (15 to 30.5 cm). It is important that its shoots are to be directed to grow upright and at the soil surface. The Sioux Water Lily can greatly blossom when planted in early springs. However, for it to establish well, the water temperature must reach 45 F degrees (7.2 cel).